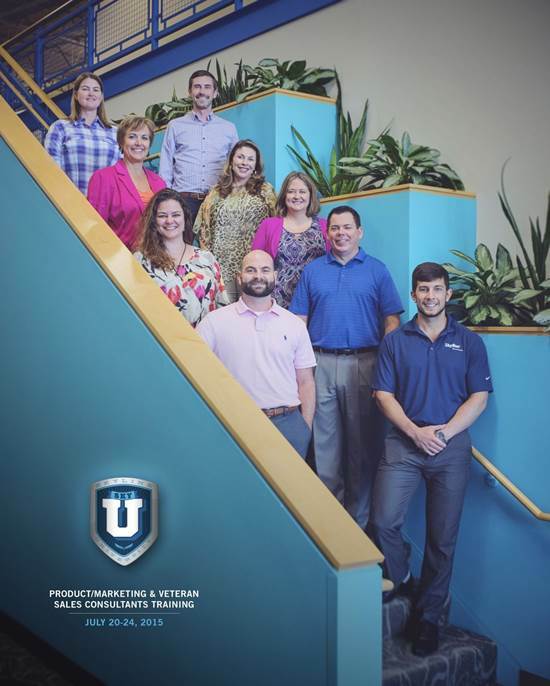 In this photo, top to bottom: Jerilyn Benson, Nicholas Morel, Diana Brayton, Linda-Marie Martinez, Alyson Moyers, Jody Myers, Joel Smith, Jeremy Schaefer, and Matthew Dunn. Nashville, TN – Skyline Exhibitor Source, a company specializing in trade show booth design in Nashville & Knoxville, Tennessee has announced the promotion of Aaron Carlson to Vice President of Operations. 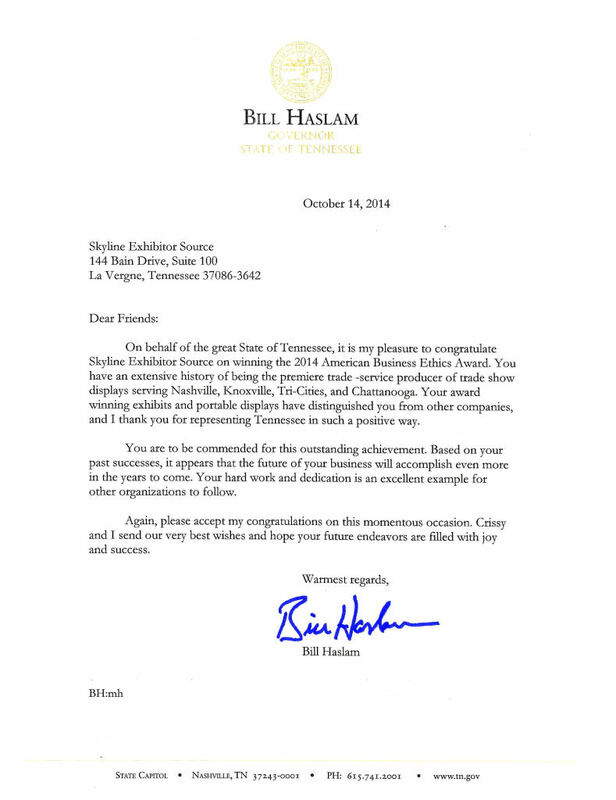 Skyline Exhibitor Source has received a letter of congratulations from Tennessee Governor Bill Haslam commending our winning of the American Business Ethics Award. We are honored to receive this recognition by our state leader! 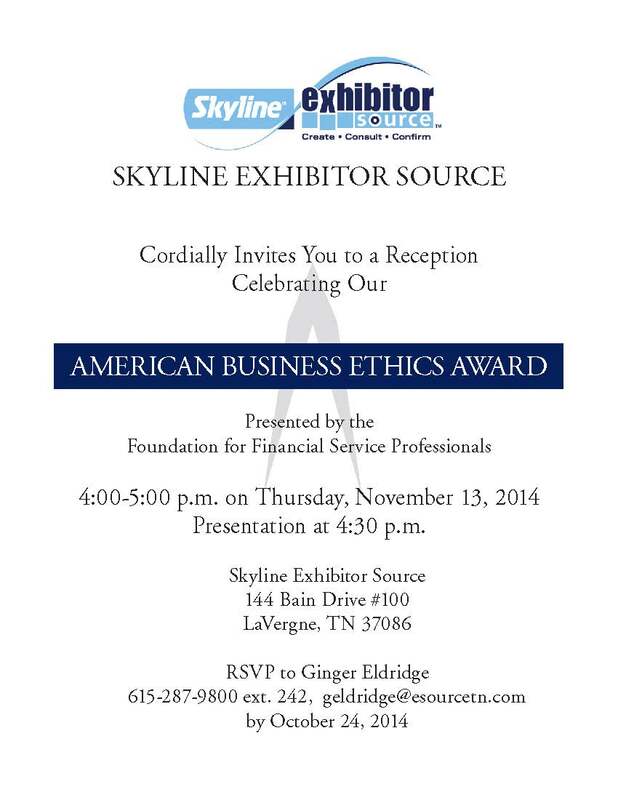 Skyline Exhibitor Source has been recognized nationally for the company's excellence in business ethics. The Foundation for Financial Service Professionals has awarded the Nashville trade show exhibit design and installation company The American Business Ethics Award (ABEA) in the "small company" category for 2014. Only one other company besides Skyline Exhibitor Source was awarded the honor this year, The Marvin Companies, in the "large company" category. 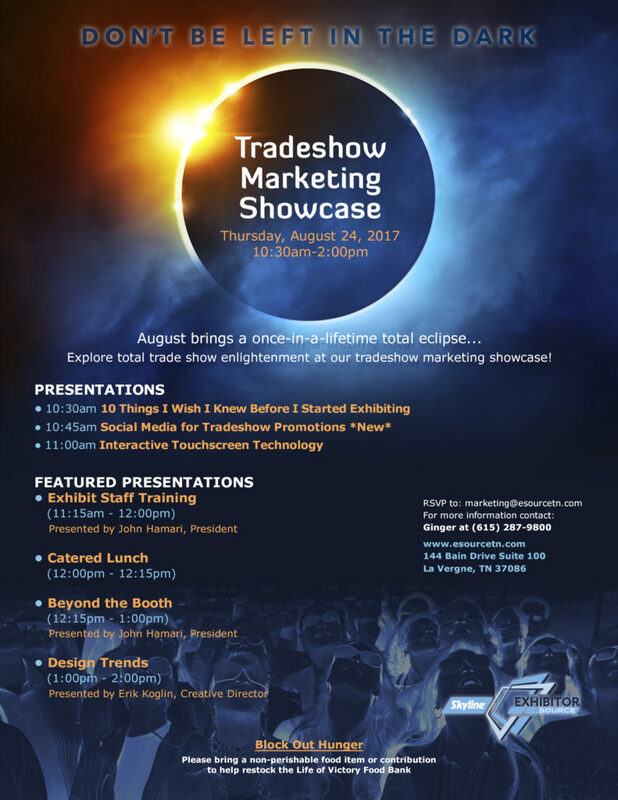 You are invited to join us on Tuesday, August 26th for our FREE educational and social event geared around trends in the trade show industry. Join a Team that's making a remarkable difference! Skyline Exhibitor Source is growing! 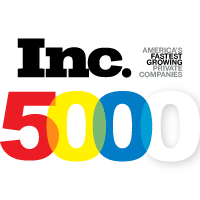 Join a twice-ranked Inc. 500 company and worldwide leader in trade show exhibits and graphics. Great health, profit sharing, dental, vision, life, and long term disability benefits including 401K. 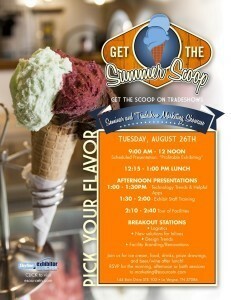 Visit our Careers page for details! Skyline® was recognized as a 2013 Event Design Awards Silver winner for Best All-Modular Exhibit! 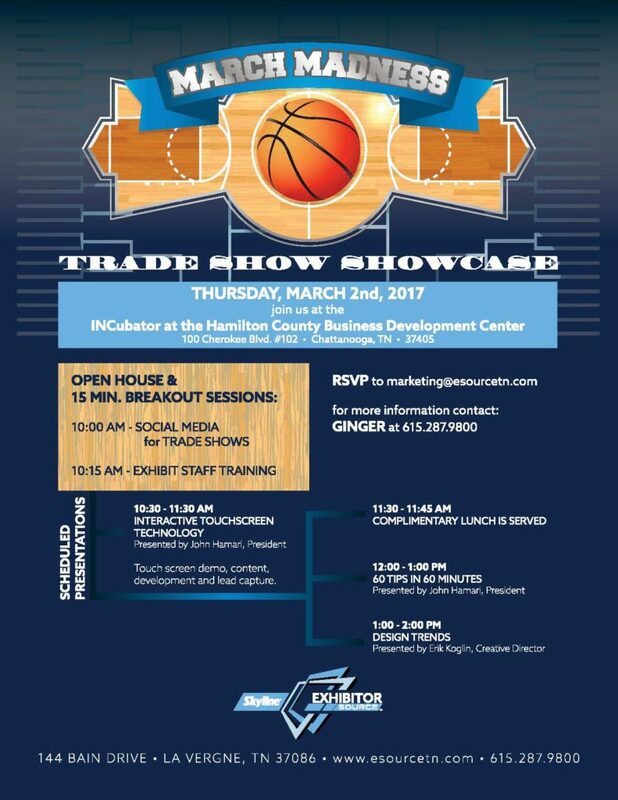 Nashville trade show display distributor, Skyline Exhibitor Source is thrilled to be a part of the winning creation: Skyline Envoy® Exhibit System. 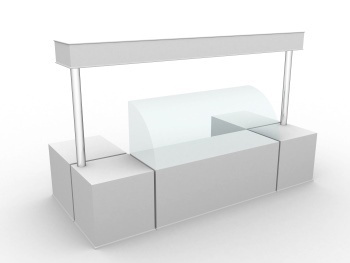 The product transforms the way trade show displays will be shown and marketed. 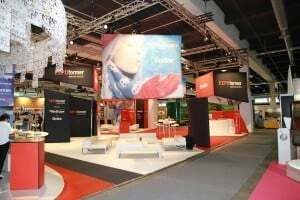 At EXHIBITOR2010, the leading world conference and exhibition on trade show and corporate event marketing, the Envoy® system won a Buyers Choice award for outstanding new product. Among all of the trade show “craziness” you’ll find inside the walls of Skyline Exhibitor Source, you will also find a huge heart in each person and a desire to help people. This heart shined brightly on August 8, 2008 as we headed out to help in the community with Habitat for Humanity. Each person took a half-day shift to lend a hand at a Habitat for Humanity house in Murfreesboro, TN, completing various tasks to help build a family a home. Throughout the day there were many reflections on all of the things in life we have to be grateful for and we were all blessed to have been part of giving back to a family in our community. 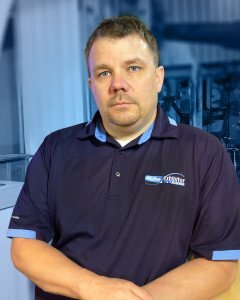 Following Hurricane Katrina a plea for help came from a person in a small town in Mississippi and was heard by John Hamari, owner of Skyline Exhibitor Source, and a Services Manager. They shared this plea with others and soon a plan was emerging to provide aid. Since money wasn't the best option for some of our staff, so they offered what they did have: their skills and time. With donations of gas cans from the Skyline Corporate office, fuel from our office, chainsaw, stuffed animals, boxes of food and water from our employees and their families, 11 team members and family members headed to Mississippi for a hard day of work clearing large trees from victim's homes. If you want to know what impact corporate tax breaks can have, ask John Hamari, owner of Skyline Exhibitor Source. John credits a tax provision that allows companies to write off $100,000 a year for equipment purchases with a business boom that helped him expand his company.